Beau Biden, Vice President's Son, Remembered In Delaware Service : The Two-Way The life of the Iraq War veteran and former attorney general was honored at a Catholic ceremony in Wilmington. 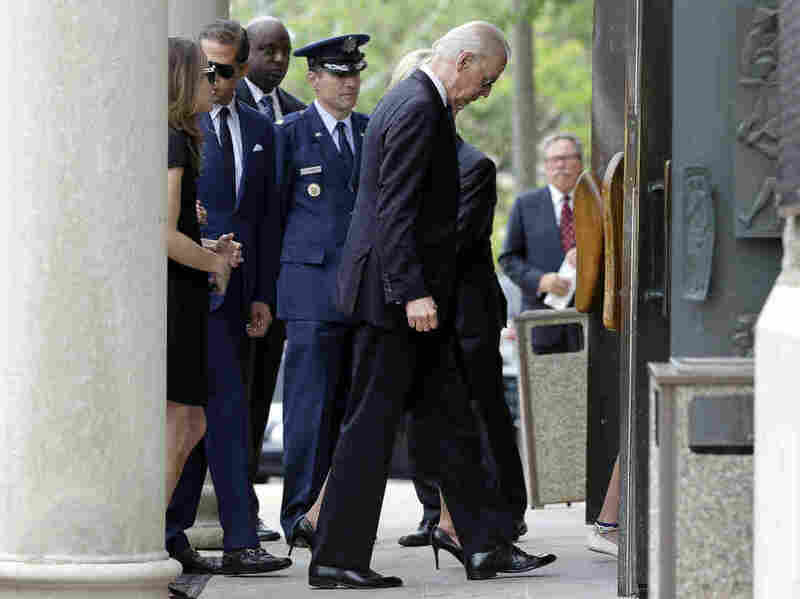 Vice President Joe Biden arrives for funeral services for his son, former Delaware Attorney General Beau Biden, on Saturday at St. Anthony of Padua Roman Catholic Church in Wilmington, Del. Beau Biden, the eldest son of the vice president, a former Delaware attorney general and an Iraq War veteran, is being laid to rest today following his death a week ago from brain cancer. President Obama called him "an original" and talked of the husband, father and "the rare politician who collected more fans than foes." The president spoke of how Beau Biden turned down the opportunity to be appointed attorney general, preferring instead to win the job at the ballot box. And then, when his father became vice president and the U.S. Senate seat was open, insisting that he needed more time to finish the job of attorney general. Beau was "an original. He was a good man. A man of character. A man who loved deeply and was loved in return," Obama said. "He did in 46 years what most of us couldn't do in 146. He left nothing in the tank," the president said. "Beau's grandfather, Joe's father, believed that the most egregious sin was to abuse your power to inflict pain on another," Obama said. "So, Beau squared his broad shoulders to protect people from that kind of abuse. He fought for homeowners who were cheated, seniors who were scammed. He even went after bullying itself." 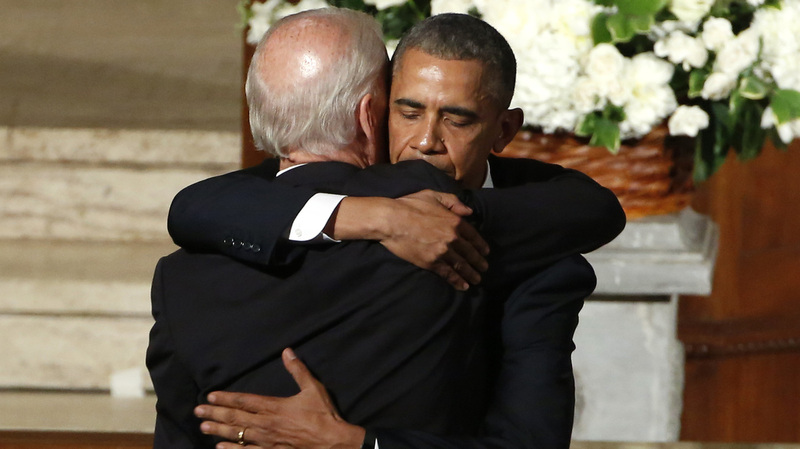 President Barack Obama hugs Vice President Joe Biden during funeral services for Biden's son, Beau Biden on Saturday, at St. Anthony of Padua Church in Wilmington, Del. Sens. Mitch McConnell and Harry Reid, Former President Bill Clinton and Hillary Clinton were among those who also attended. Gen. Raymond Odierno, chief of staff of the U.S. Army, awarded Beau Biden the Legion of Merit "for his lifetime of service as a soldier, an advocate and an American Patriot." Along the route to St. Anthony of Padua Roman Catholic Church in Wilmington, Del., where the service was held, several onlookers held signs reading "God bless the Biden family" and "God bless Beau and Joe" as the motorcade drove past. The Bidens looked on as members of the New Castle County Police sat at attention atop Clydesdales, a bagpipes band played and the motorcade came to a stop. Ahead of the service, in which an estimated 1,000 attended, mourners lined up for blocks to pay their respects. Joseph Robinette "Beau" Biden III, 46, served two terms as attorney general and was widely viewed as a likely gubernatorial candidate. A major in the Delaware Army National Guard, he was deployed to Iraq in 2008, returning home a year later. He was awarded the Bronze Star for his service. In 2010, he suffered a stroke. Three years later he was diagnosed with brain cancer; he had a lesion removed and he underwent radiation and chemotherapy. The cancer went into remission. Last month, however, he was admitted to Walter Reed National Military Medical Center in Bethesda, Md., and died on May 30. In a statement released after his son's death, Vice President Biden said, "More than his professional accomplishments, Beau measured himself as a husband, father, son and brother. His absolute honor made him a role model for our family. Beau embodied my father's saying that a parent knows success when his child turns out better than he did." The Associated Press notes: "His death drew passionate expressions of sympathy from across the political spectrum, the sense of sadness heightened by the tragedy that the Biden family has endured over the years."